It’s the beginning of our international season and off to London we go…. And after all this travel time, we head straight to the pool for a training session…. As you can guess we are all lovin’ life right now. After training we head to the hotel, where we can’t check in till 2….. only 3 hours away. So we grab some lunch and wander a bit of the surrounding area of our hotel (not much to see). We finally get to our rooms to relax for a bit, only to find out that we are heading to the gym in about an hour to do weights. Never a dull moment on the road. Needless to say we were all buggered and crashed quite early that night. This first event of the international season allows us to test out the Olympic Venue, which is not only exciting but important to get an understanding of how the games will progress behind the scenes. Plus we have had a sneaky peek around the Olympic compound and the other venues. 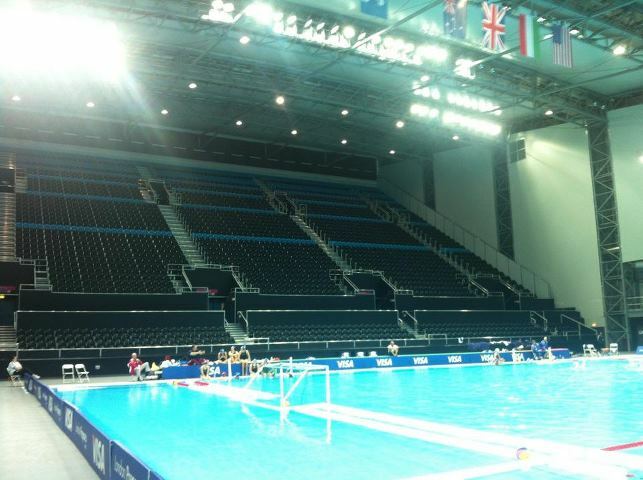 We are here to play 3 round games, followed by a final against the likes of USA, Hungary and Great Britain. From all reports the 5000 seat stadium should be near capacity, which should create an amazing atmosphere. We have our first game against the Brits on Thursday night. Should be a good hit out. The first leg of our trip begins…..